Hackney to sell off Dalston playground. Public green land owned by the Council is to be sold as part of a major private development in Dalston. 120 flats, in 5 to 10 storey blocks, are to be built on land which had been earmarked as a priority by the Council for a public children's playground. The recently approved Dalston Area Action Plan (DAAP) specified that the public playground would be specially landscaped and designed as an "active youth space" for kids of twelve years and over. But there's no sign of that in the development scheme proposed. 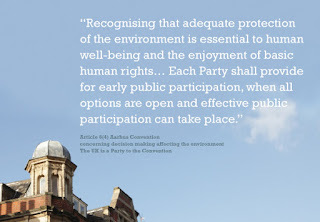 The GLA London Planners have even suggested that a designated 'semi-private courtyard' should be entirely privatised to give residents in the flats "a sense of ownership". The development will be 87% privately owned. 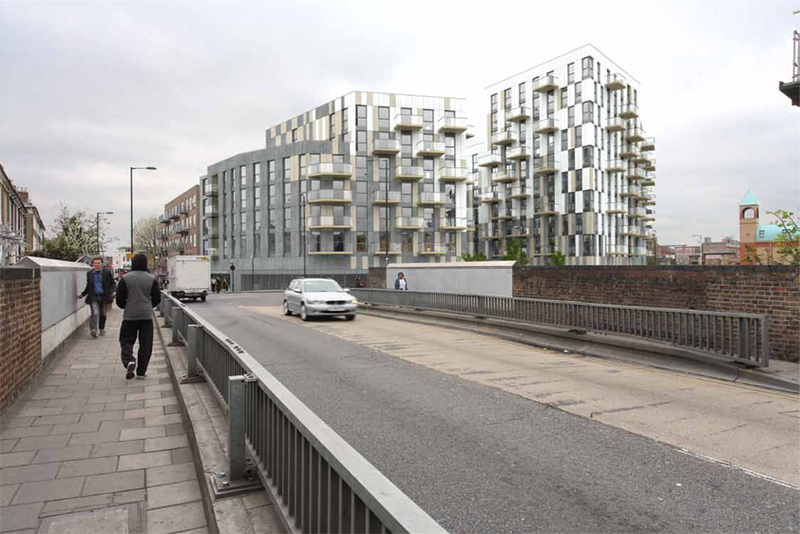 Artist's impression from Dalston Lane railway bridge with blocks rising from five to ten stories. We are told that the Council's Planning Department has already decided to recommend the scheme although it departs radically from its own DAAP guidelines for the site in terms of building height, housing density, priority employment uses and affordable housing. On 11 February OPEN Dalston attended a meeting with the GLA's Deputy Mayor for Transport and senior commercial development officers of Transport for London. 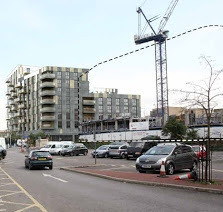 At the meeting we presented some alternative proposals to the Western Curve gated community for which TfL had applied to Hackney for planning permission (and which it has since withdrawn). 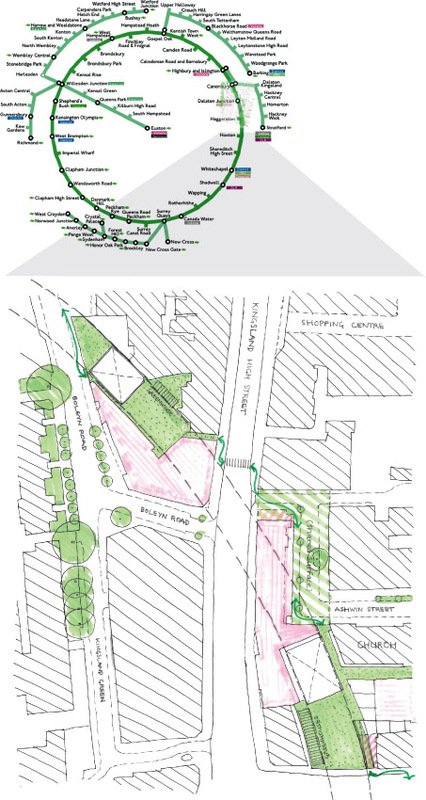 You can read a summary of one of our proposals, "Linking Dalston's green spaces". 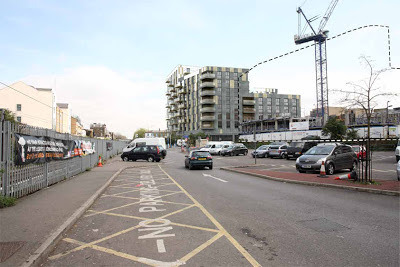 TfL, and its development partners Taylor Wimpey, had come to Dalston with a "pre-formed" plan and it responded to public consultation with cosmetic changes only. Our objections to TfL's plan are not confined to the lack of green spaces and improvements to 'public realm'. We also consider that the scheme's exclusive 'gated community', the lack of adequate affordable and family housing, and the damage to local heritage and character require changes. In our "Linking Dalston's green spaces" presentation you will find an analysis of Dalston's development context, a detailed evidence base, our objections to TfLs scheme and some innovative ideas for greening over TfL's Overground railway tunnels. TfL have agreed to consider and evaluate our proposals and a further meeting with them is being arranged. 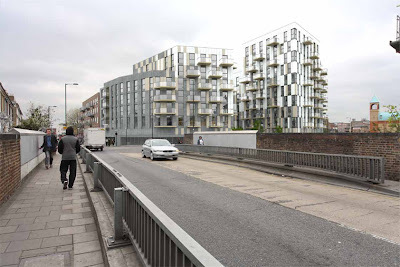 These are the images for the renewed planning application to re-develop 67A - 76 Dalston Lane - the site on the corner of Dalston Lane and Martel Place E8 by the mini-roundabout which leads to the Kingsland Shopping Centre/Matalan's rear car park. This is a major strategic development which requires the Greater London Authority's, as well as Hackney Council's, approval. Unusually the developer has itself, for some reason, undertaken no public consultation and few people locally seem to know about it. 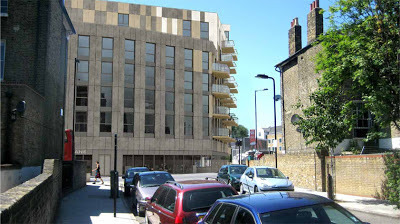 The Dalston Area Action Plan (DAAP) identifies the site as suitable for 4-6 storeys but Council planners now apparently consider that the DAAP is "open to interpretation" and are rumoured to be recommending approval of a frontage bloc of 5 storeys rising to 7 and 10 storeys further back. 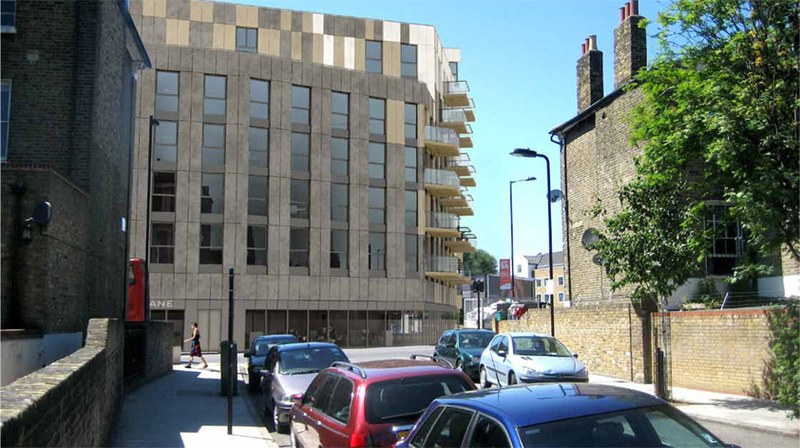 The developer proposes 121 flats of which 70% will be one and two bedrooms. 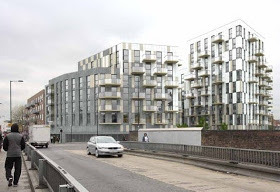 The total 'affordable' flats in the amended scheme has been reduced from 44 to 24 flats - that is 18% by habitable rooms, although Council and GLA policies targets seek to achieve 50% 'affordable' flats in new developments. It is expected that the majority of flats will be bought by investors and that, as elsewhere, many will simply be left empty to await house price rises. The site is part of Dalston's "designated Priority Employment Area (PEA), where employment generating floorspace (B1) will be the preferred uses.” The developer claims that the 50 desk spaces proposed will result in a net employment gain but overlooks the total loss of all affordable studios used by some 60 or more artists who will be displaced from the site and an overall reduction of at least 25% of the existing employment area. Artists impression of the view from the listed German Hospital and Lutheran Church in Ritson Road, within the Graham Road and Mapledene Conservation Area on the east side of Dalston Lane. 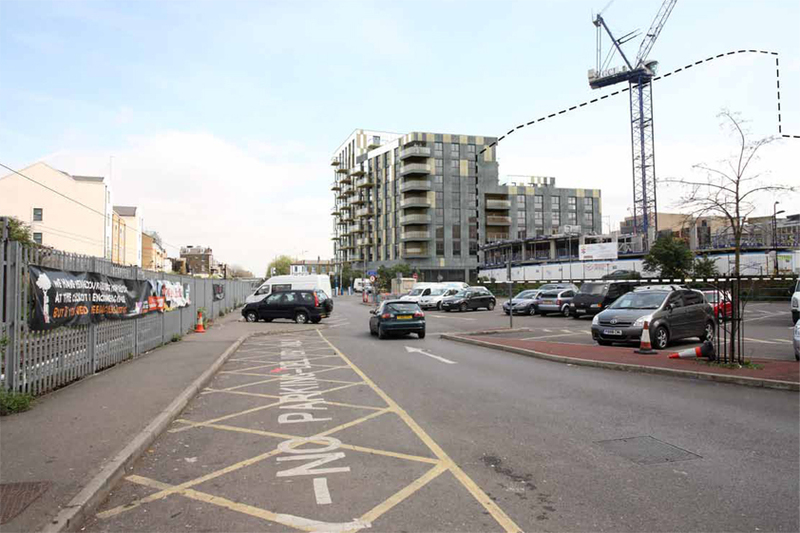 The development will dominate the residential buildings of the Conservation Area opposite the site and, with other tall buildings, will contribute to the "cliff" effect lining the Eastern Curve pedestrian route overlooking the Kingsland Shopping Centre car park.